Peaks. Valleys. Plateaus. Wildernesses. Israel’s terrain is much like our own spiritual journeys. Walk the land of the Bible with Chuck Swindoll, and gain fresh insight into real people and significant biblical events that impact our lives today. Join Chuck via DVD for meaningful messages from God’s Word, taught on-location in places like old Jerusalem, Caesarea, the Mount of Beatitudes, and even aboard a boat on the Sea of Galilee. Two added bonuses enrich this experience in the land of the book: you’ll trek with host Wayne Stiles through the actual locations where significant biblical events happened, and you’ll “meet” six characters from the pages of Scripture through gifted actor and professor Reg Grant. 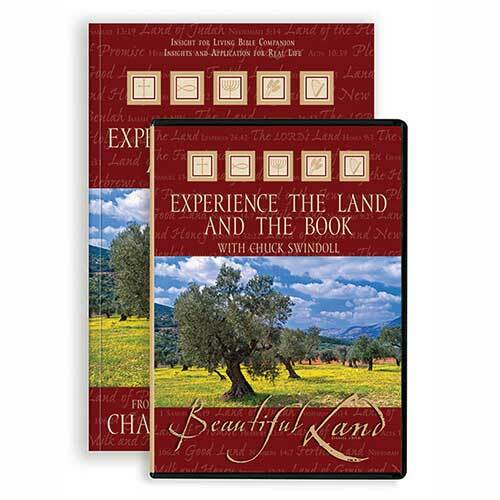 Be prepared to take to heart what God teaches you through these DVDs and accompanying Bible Companion, as you experience the land and the Book He calls His own.